Chrysler’s M300C 3.0L V6 CRD is proof that luxury need not mean excess. What will it take to convince Chrysler to sell this vehicle in the U.S. market? Maybe if 20,000 people visit their local dealership and ask to test drive the M300 3.0L CRD … weekly. Maybe if we flood all the vehicle request forms on all U.S. Chrysler dealership websites? This vehicle will run on B20 so will achieve 40mppg (Miles Per Petroleum Gallon). The Great State of Minnesota already has a B20 mandate by 2015. 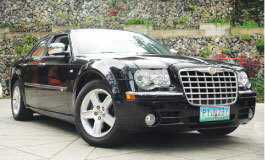 MANILA, Philippines — When I first drove a Chrysler 300C a few years ago, I was mainly concerned about its fuel mileage. It was a HEMI variant, no less, and its V8 gasoline engine didn’t seem like the most practical thing around — especially when you enjoy driving enthusiastically. Believe me, it is hard to hold back with 340 horses on tap. Of course, there are advantages to having a V8 under the hood (like getting up to cruising speed quickly) and there are also ways to wring the most out of every drop of petrol with it. But, I think it is the overpowering American-gas-guzzler reputation that is hard to shake when behind the wheel of a 300C HEMI, hence its negative image among efficiency buffs. Needless to say, I limited my driving to within the city for fear of emptying my already skinny wallet. I became curious when CATS Motors, local distributors of Dodge, Jeep, Mercedes-Benz and Chrysler recently brought in the 3.0-liter V6 CRD version of the 300C. The decision wasn’t unexpected, of course. Every European manufacturer has a diesel-powered variant in their premium luxury sedan stable, so Chrysler should, too. When I was handed the keys to the diesel beast, I made a quick decision to pile on some kilometers on the odometer. A drive from Manila to Baguio and back would be a fitting way to put the 300C’s ‘utilitarian’ engine to the test. When I fired the motor up, I was amazed at the lack of any sort of expected diesel racket. No engine clatter makes its way into the cabin at all, and even while I stood outside, the sound of the V6 was almost imperceptible. Diesel technology has indeed come a long way, and with 510 Newton-meters or 376ft-lbs of torque at my disposal, I was eager to hit the road. Along the highway, it is possible to maintain an average of 100kph with the engine barely turning 1,800rpm. Put the pedal to the floor, though, and all passengers will be treated to neck-snapping acceleration. Long, wide and rear-wheel drive, the 300C is very stable and confidence inspiring at highway speeds. Its 18-inch alloys shod in Pirellis remain planted and secure, while the chassis soaks up any and all road imperfections. Once we arrived at the base of Kennon Road, the Chrysler was very maneuverable through the twisties. No doubt that it is large, but getting used to its dimensions is very easy. In fact, the 300C will grow on you very quickly. What endeared me even more was how the 300C hauled up the mountain with barely any effort. What this means is that it managed to deliver an average of 14km/L (over 33mpg US – 35mppg per B3 in the Philippines) from Manila to Baguio. This is a very decent mileage figure, with no economy driving tricks used. At P2,850,000, the 300C belongs in the premium luxury segment, and at this price level, no convenience and safety features are lacking at all. The leather is plush yet supportive and you get plenty of legroom all around. The Boston Acoustics speakers sound excellent, while the MyGig multimedia entertainment system is a joy to use. Double-takes from bystanders to see who is riding inside will be a normal occurrence. The trunk is also very massive, able to swallow my mountain bike with only some disassembly. The 300C 3.0L V6 CRD is a car that I can easily live with. Driving it is a pleasure, and long hauls will just breeze by because of the opulence of the ride quality and interior finish. After spending 480kms behind its wheel, my perception of American cars did a complete 180-degree turn. It is possible to drive around in a massive land yacht, draw stares, command the road — and not have an ounce of guilt when putting the pedal to the floor. Luxury and frugality at the pumps isn’t unthinkable anymore. With the diesel revolution upon us, who says that you can’t have it all in a luxury vehicle?